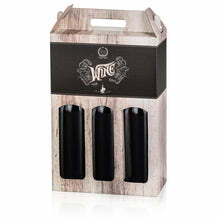 Product No: P660630 - "Carrying Case assortment" Wine "kraft paper nature 1er"
Carrying bag made of kraft paper. An assortment of 4 different designs. Suitable for wine / sparkling wine. Particularly stable quality: 200 gr / m². Made of FSC® certified material.